Notes When there is no cliffs to build a nest on, a Sociable Weaver's nest on a high pole is just as good. These pair of Verreaux's Eagles is breeding here for a couple of years. It is about half way between Prieska and Copperton. 3048 783 24/9/2012 0 When there is no cliffs to build a nest on, a Sociable Weaver's nest on a high pole is just as good. These pair of Verreaux's Eagles is breeding here for a couple of years. It is about half way between Prieska and Copperton. 6861 783 27/7/2013 0 Black Eagle nest on top of the Sociable Weavers nest that is probably being monitored by Japie. The chick's head is visible in 2 of the photos. On Sunday 27 July 2013 the chick was about the size of a bantam, with black feathers starting to appear through the down. The nest should be reachable for marking purposes at the risk of dislodging the whole structure. 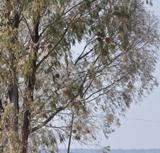 12061 783 29/7/2014 0 Black eagle nest built over sociable weaver nest on telephone pole. 1 adult observed on nest, a second soaring in the vicinity. One downy chick observed, the head of which was sometimes visible above the nest rim. 18887 783 21/9/2014 0 pair of Verreaux's Eagles on a bare pole, closest to weaver nest with a sociable weaver's nest, with a Verreaux's Eagle juvenile on top of weaver nest. Weavers nests on the adjacent poles had bones on top of them, and were possibly serving as â€œdinner tablesâ€�. The one nearest the Verreaux's nest had what appeared to be two forelimbs of a small antelope â€“ these were fresh enough to have the skin and hooves still intact. The next two poles also had sociable weaver nests on them with bones on top, though these bones appeared older and drier, fewer in number and they had no flesh on them. 18488 783 26/10/2015 0 Black eagle pair with juvenile very close to sociable weaver nest on telephone pole.